PTFE is often used to coat non-stick frying pans as it is hydrophobic and has a fairly high heat resistance. In chemistry, Polytetrafluoroethylene (often shortened to PTFE) is a polymer of tetrafluoroethylene. It is a fluoropolymer, because the polymerization is based on strong bonds of fluorine and carbon. Polytetrafluoroethylene is not very reactive. It also repels oil and water. E. I. du Pont de Nemours and Company developed it in 1938. It is better known by its trade-names, Teflon, and Gore-Tex. 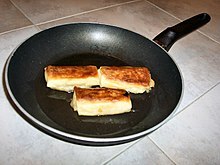 Teflon is a coating done to frying pans, among others. Gore-Tex is a membrane used in clothing. Perfluorooctanoic acid is needed to produce Polytetrafluoroethylene. Perfluorooctanoic acid is because it is very toxic for people and may cause cancer. The precursors for many chemical weapons are highly corrosive, their containers are therefore often treated with Polytetrafluoroethylene. For this reason, the export of Polytetrafluoroethylene from the European Union may need a special permit. This page was last changed on 6 August 2018, at 02:36.